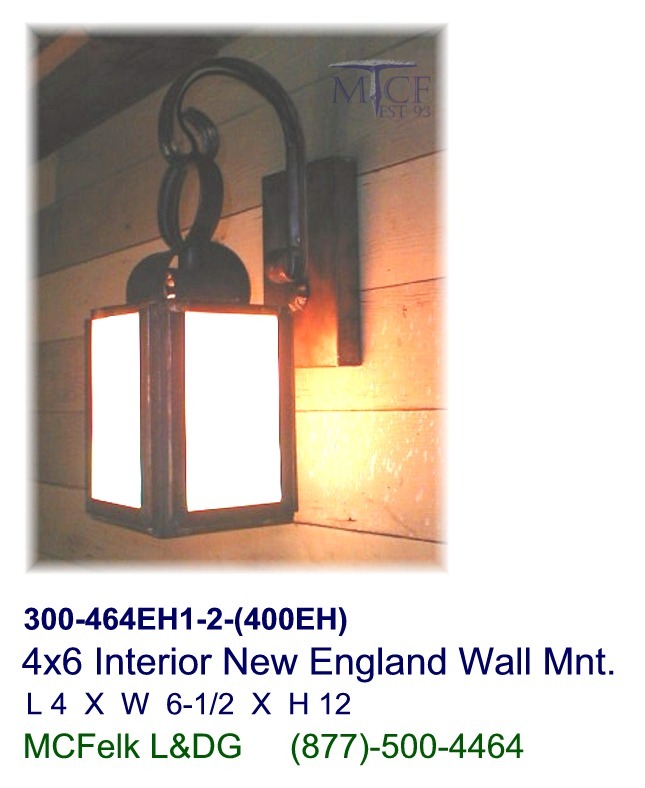 4x6 Interior New England Wall Mount hung by hanger ring w/concealed wire. 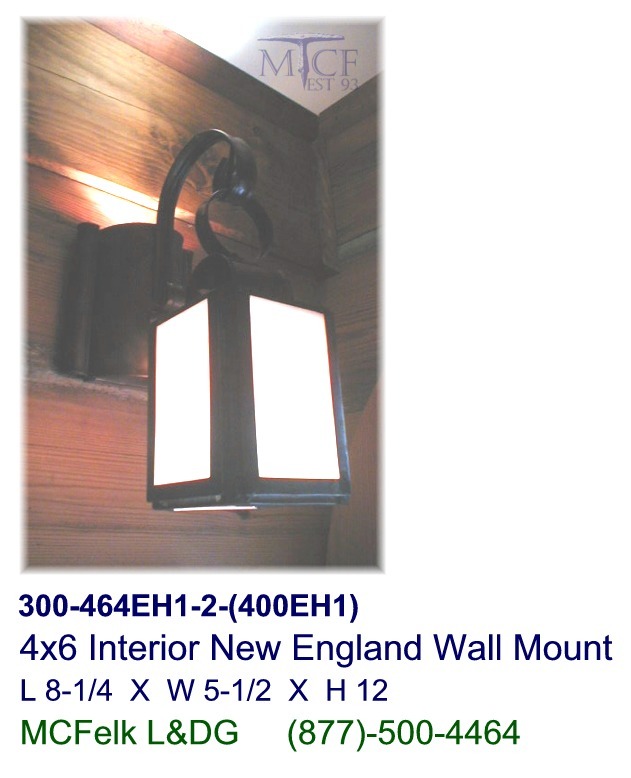 Features: Open lantern base box & ornamental mounting hardware. 9 x 20 Exterior Shaker Wall mount, Propane Gas, Banded glass. Takes 1-Single Burner candelabra. Features: Auto ignition and extinguish capabilities. 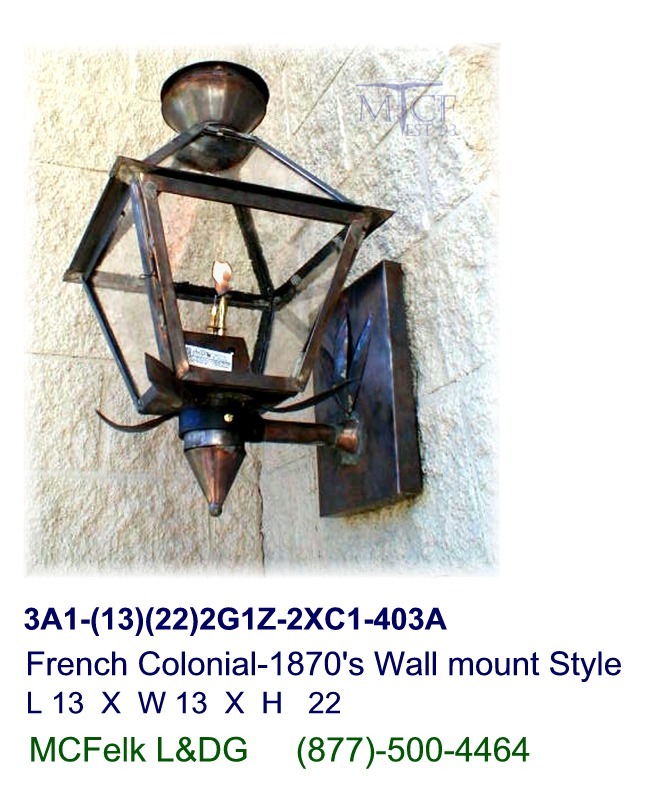 French Colonial- 1870's Wall mount Style (Nat. 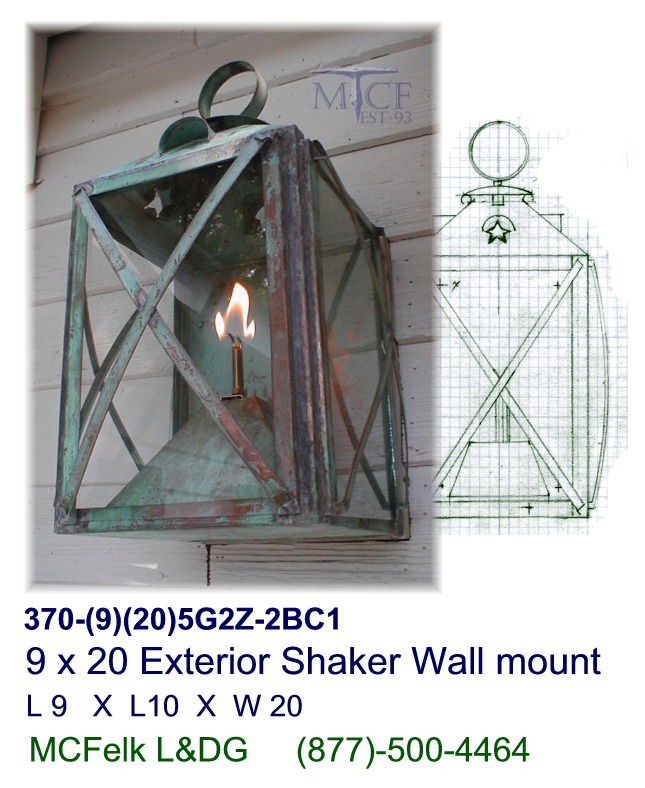 Gas) lantern with ornamental wall mounted bracket. 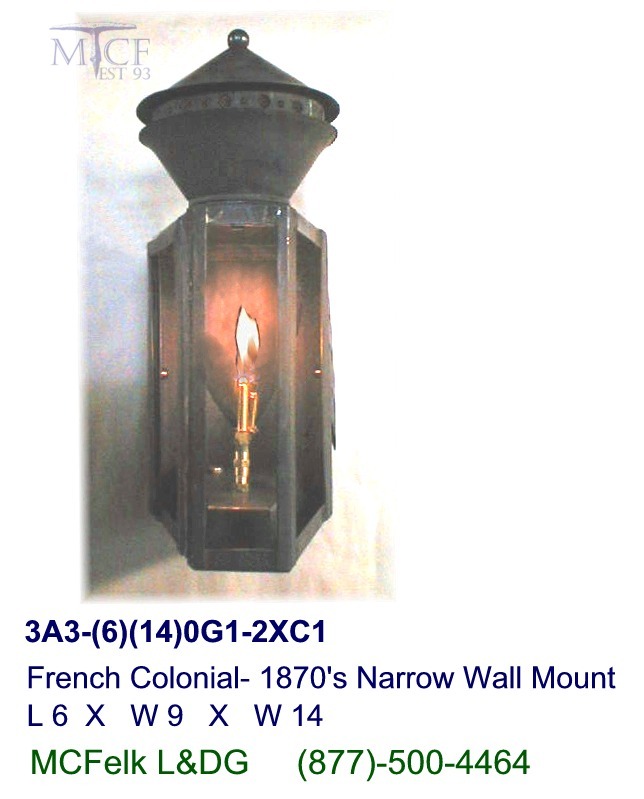 French Colonial- 1870's Narrow Wall Mount natural gas open atmosphere single flame. Includes: Custom finish, rounded front & side corner presentation, single exterior vertically reciprocating glass pane, plus two interior clipped panes, auto extinquish, rear vent rails, narrow fit to wall profile, design standard as custom fit removable chimney crown & ventilation assembly plus ornamental leaf details. French Colonial- 1870's Flush Wall mount Style (Nat. 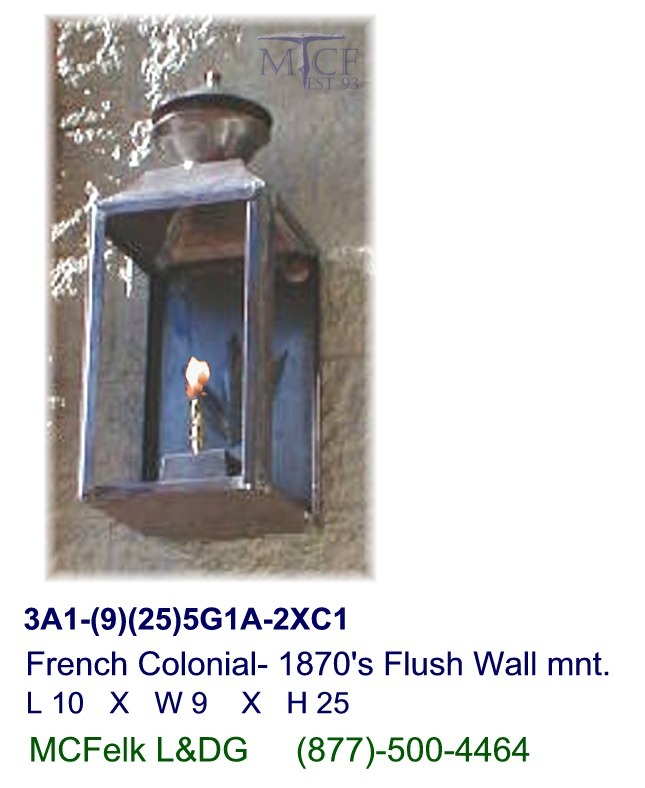 Gas) lantern with ornamental wall mounted Cover and Frame. 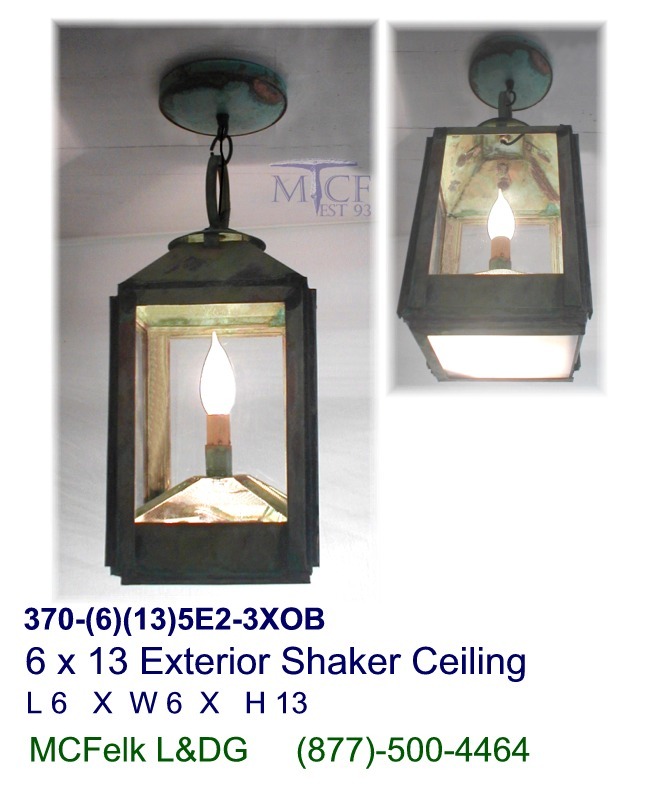 6 x 13 Exterior Shaker Ceiling hook mount, non-banded glass. Takes 1-60Watt max. single candelabra bulb up, and single 40watt latteral base over frosted white framed base lens down. Features: Original period 1860's copper pyramid bronzed screened reservoir up, optional separate up and down lighting control. Additional options are available in accessories for hanging hardware as canopy excluded as shown contact for details. 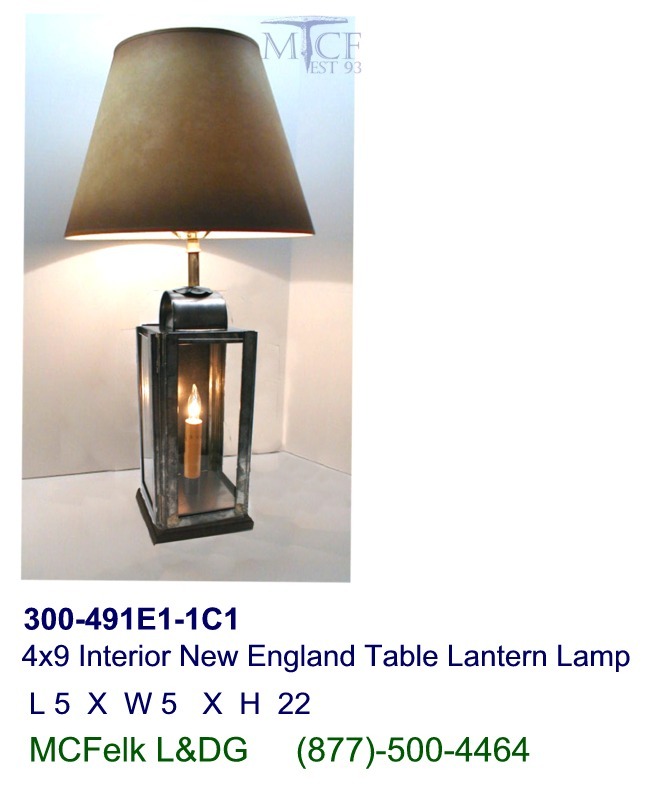 4x9 Interior New England Table Lantern Lamp W/ 9in harp, dual controlled. Takes 1-40Watt max. candelabra bulb in base, 1-Standard 150 Watt max. bulb at upper stem. (Includes: 8ft. Blk. cord, Hardwood Maple base stained-Early Amer. with protective poly coating, plus felt table surface protective pads.) Shade sold separately, see accessories item #VNB657-1210. 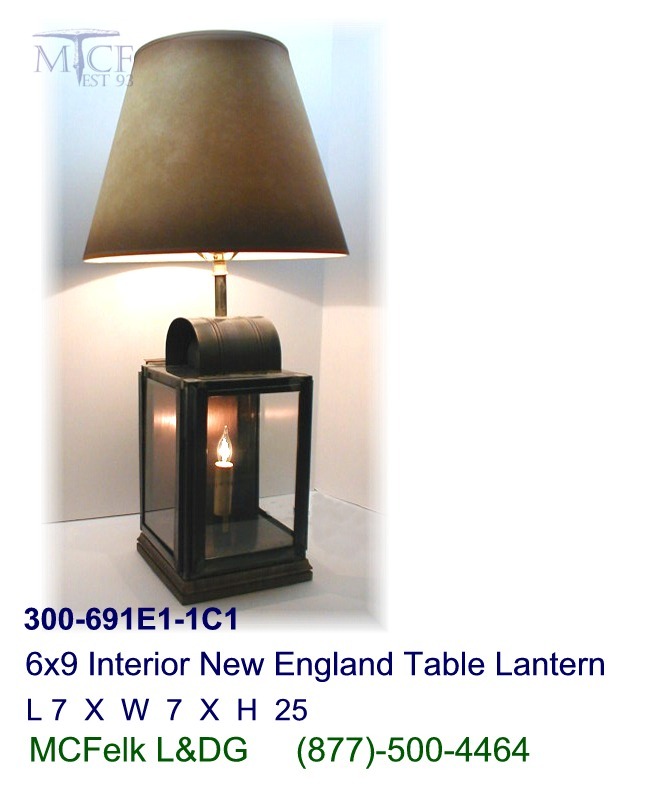 6x9 Interior New England Table Lantern Lamp W/10in harp, dual controlled. Takes 1-60Watt max. candelabra bulb in base, 1-Standard 150 Watt max. bullb at upper stem. (Includes: 8ft. Blk. cord, Hardwood Maple base stained-Early American with clear protective poly coating, plus felt table surface protective pads) [Notes: Candelabra bulb change via rear Copper or in material choice vertical reciprocating sliding door.] Shade sold separately, see accessories item #VNB657-1411. 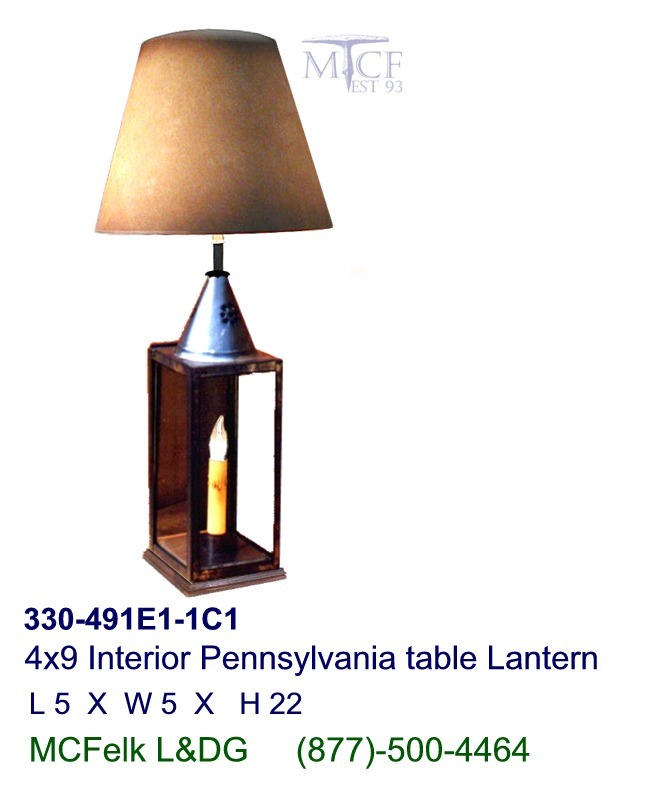 4x9 Interior Pennsylvania table Lantern Lamp w/ 9in. harp. Takes 1-Stnd.150 Watt max. at upper stem and 1-40Watt max. candelabra bulb in base. (Includes: Single circuit dual control plus 8ft. Black cord, Hardwood Maple base stained-Early American with polyethylene coated base, plus felt table surface pads.) Shade sold separately, see accessories item # VNB657-1210. 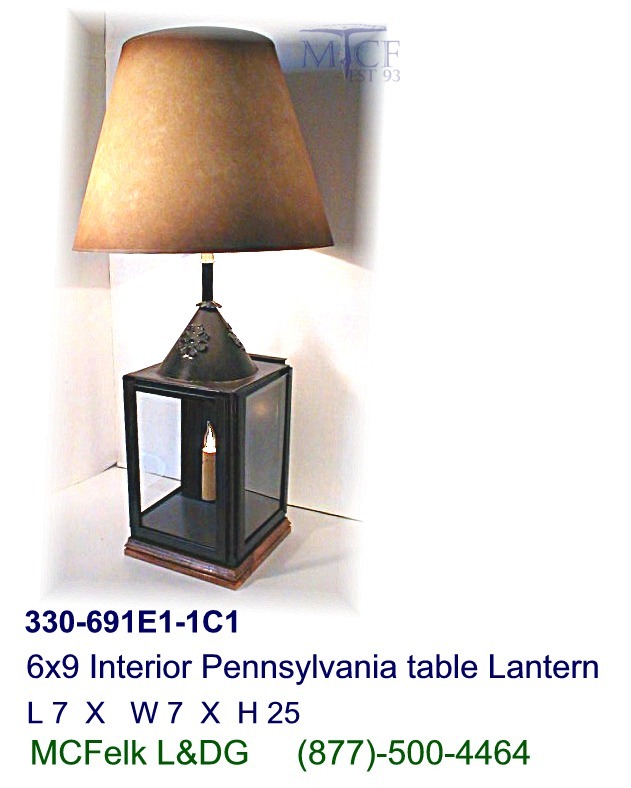 6x9 Interior Pennsylvania table Lantern Lamp w/ 10in. harp. Shade sold separately, see accessories item #VNB657-1411. 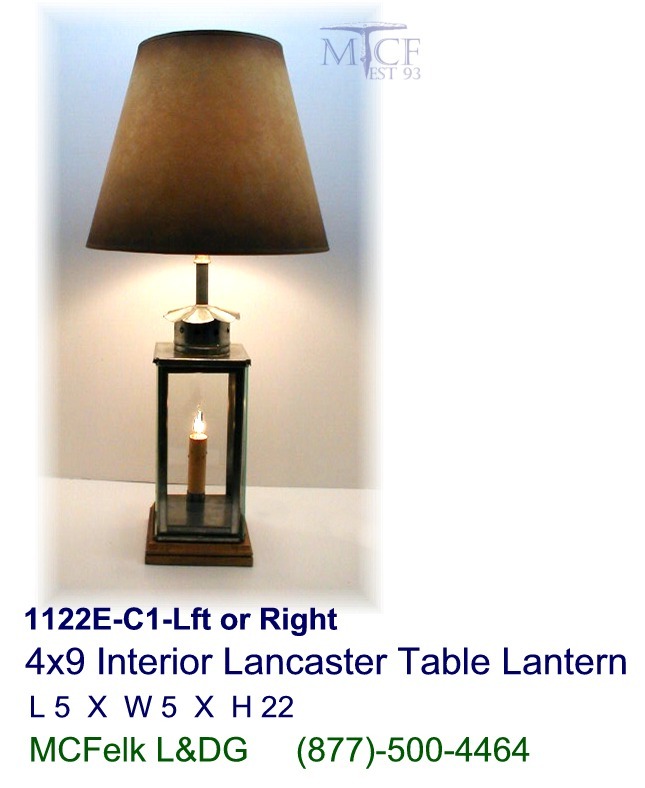 4x9 Interior Lancaster Table Lantern Lamp W/ 9in harp, dual controlled. Takes 1-40Watt max. candelabra bulb in base, 1-Standard 150 Watt max. bulb at upper stem. (Includes: 8ft. Blk. cord, Hardwood Maple base stained-Early Amer. with protective poly coating, plus felt table surface protective pads, and Lancaster fluted transition cap at chimney.) [Notes: Candelabra bulb change via horizontally glass sliding pane.] Shade sold separately, see accessories item # VNB657-1210. 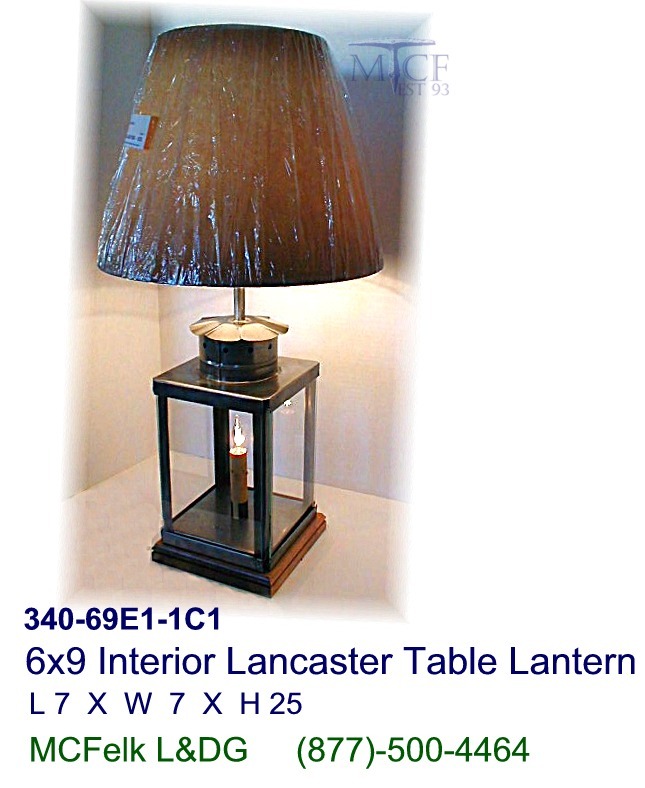 6x9 Interior Lancaster Table Lantern Lamp W/ 10in harp, dual controlled. Takes 1-40Watt max. candelabra bulb in base, 1-Standard 150 Watt max. bulb at upper stem. (Includes: 8ft. Blk. cord, Hardwood Maple base stained-Early Amer. with protective poly coating, plus felt table surface protective pads) [Notes: Candelabra bulb change via horizontally glass sliding pane.] Shade sold separately, see accessories item #VNB657-1411. 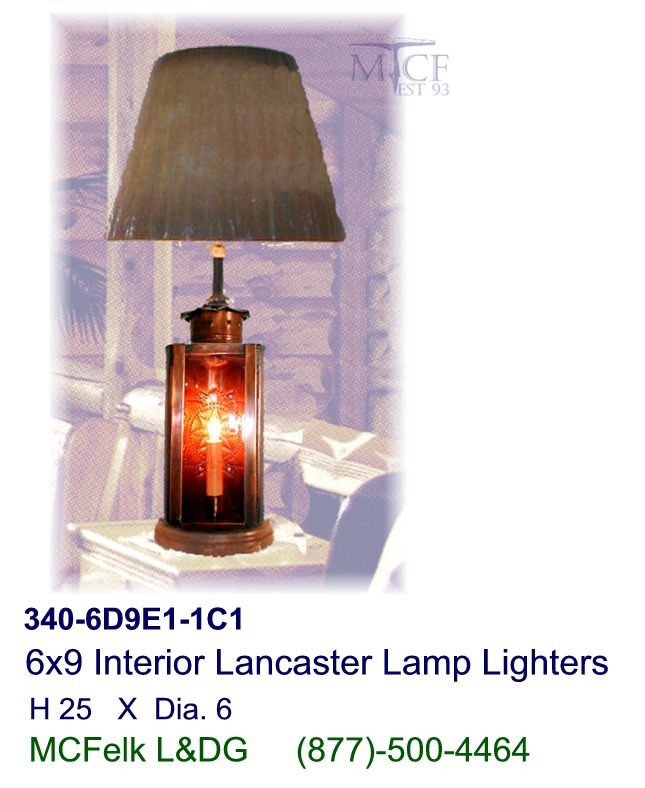 6x9 Interior Lancaster Lamp Lighters Table Lantern Lamp W/ 10in harp, dual controlled. Takes 1-40Watt max. candelabra bulb in base, 1-Standard 150 Watt max. bulb at upper stem. (Includes: 8ft. Blk. cord, 7in. dia. Rnd. Hardwood Maple base stained-Early Amer. with protective poly coating, plus felt table surface protective pads.) Shade sold separately, see accessories item #VNB657-1411. 6in dia. 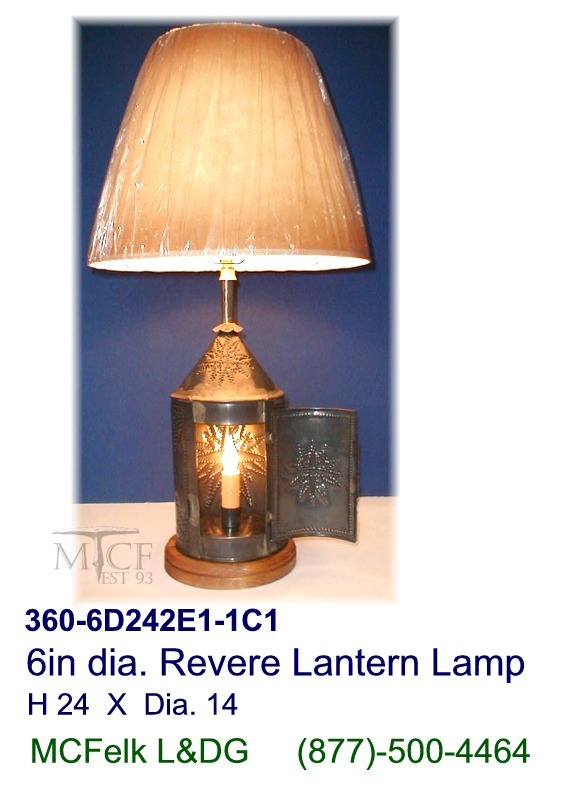 Revere Lantern Lamp w/10in harp. Includes custom perforated art each. 2@6x6, dual controlled 1-40Watt cndle in base, 1-Stnd. 150 Watts at upper stem, 8ft. cord. (includes: Rnd. Hardwood Maple, color-Early Amer. stained & poly coated base plus felt table surface pads.) Shade sold separately, see accessories item #VNB657-1411. 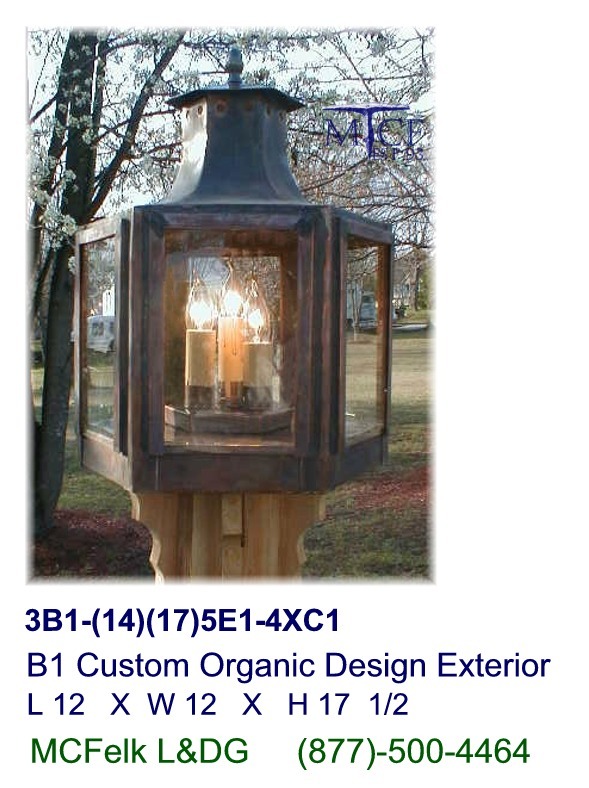 B1 Custom Organic Design Exterior Post Mounted Lantern. Takes single 60 watt CA-10 Standard E1 Base max.candelabra bulb. 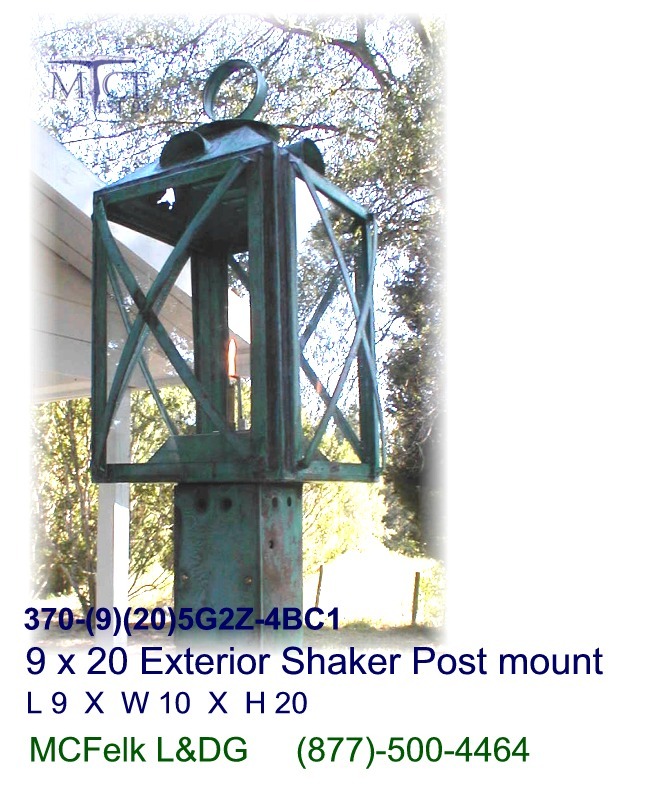 9 x 20 Exterior Shaker Post mount, Propane Gas, Banded glass. 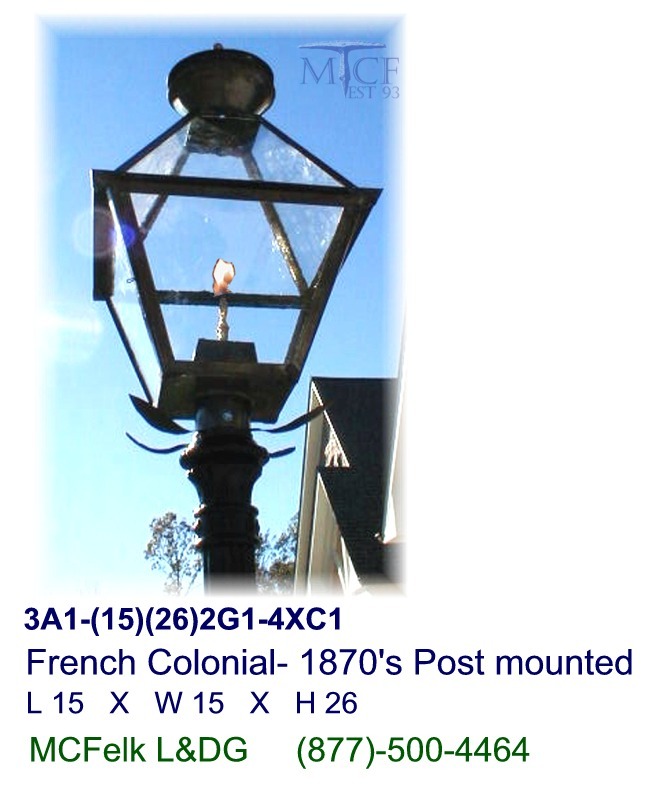 French Colonial- 1870's Post mounted Style (Nat. Gas) Lantern.